From Hokkaido to Okinawa, the Japanese grow many types of white potatoes and sweet potatoes and have scads of ways of eating them. 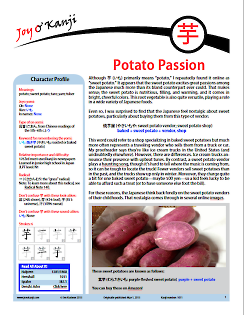 Find out when 芋 represents which of its many definitions, why a "new potato" label is crucial, what "sweet potato color" means, and what a potato stamp is. Also see why sweet potatoes prompt passion, nostalgia, embarrassed laughter, and excuses. pp. 2, 4, 9, and 17: Removed broken links and (where apppropriate) the surrounding text. p. 10, 1st photo: I had said that the sign for sweet potato ice cream featured the rendering 紫芋. I must have been delusional! It says 紫いも. p. 5: I had somehow confused 種芋 (たねいも: seed potato) with 芋つる苗 (いもつるなえ: (sweet) potato vines that can be used as seedlings). I have removed the three sentences about 芋つる苗. May 8, 2015: p. 9, photo caption: Changed the first and last paragraphs to reflect that the shop is in Kawasaki (not Kamakura) and that the third dessert is named after the city of Bremen because of a story that is quite famous in Japan. May 1, 2015: Originally published.